Against the Rules - Lesbians and Gays in Sport, an exhibition presented by the acceptance campaign office of the ministry for youth, family and health of the North Rhine-Westphalia regional government and organised jointly by SC Janus, Cologne’s Centrum Schwule Geschichte (Gay History Centre) and others, represented an initial appraisal of the subject. It was updated by the European Gay & Lesbian Sport Federation (EGLSF) in 2010 and translated into English. The exhibition, opened on May 4, 2010 in Berlin, does not claim to be exhaustive, but aims to help remove the taboos from the subject of homosexuality and sport, and draw attention to the various forms of discrimination against sexual minorities in sport. In 2012, within the programme Football for Equality, the exhibition was updated again and translated in several European languages (currently available in English, French, German, Hungarian, Italian, Slovenian, Slovak, Spanish). 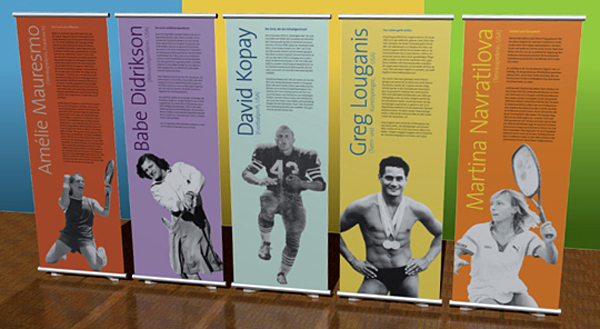 The exhibition consists of 37 banners in total, giving introduction and information on elite athletes, discrimination, lesbian & gay clubs & federations, Gay Games, OutGames, EuroGames and portraying LGBT athletes Amelie Mauresmo, Babe Didrickson, Billie Jean King, Bob Paris, David Kopay, Gottfried von Cramm, Greg Louganis, Heinz Bonn, Ian Roberts, Imke Duplitzer, John Blankenstein, Judith Arndt, Justin Fashanu, Marcus Urban, Marie Carsten, Mark Tewksbury, Martina Navratilova, Otto Peltzer, Parinya Kiatbusaba, and Tom Waddell. The exhibition Against the Rules – Lesbians and Gays in Sport is a travelling exhibition by EGLSF. You can also rent the exhibition in several languages free of charge and show the exhibition yourself. You only have to pay for transportation costs. For information please contact us at exhibition@eglsf.info.